The recent bribery allegations made against an offshore arm of Leighton Holdings in Iraq  and Tabcorp in Cambodia  shouldn’t be taken lightly in Australia. They come on the back of the Australian Wheat Board (AWB) oil-for-food scandal , and Securency International and Note Printing Australia  bribery charges. In the background, Australia has dropped six places in the Transparency International Corruption Perception Index  from seventh equal place in 2012 to thirteenth equal in 2015. The first step in addressing the problem of bribery and corruption is improved safeguards for dobbing-in corrupt officials and those involved in corporate wrongdoing. The bottom line: Australians don’t feel secure in blowing the whistle. That needs to change. Australia needs a stronger whistleblowing regime. That means we need better protection laws; a third party to report wrongdoing to; cultural change at the organisational and individual levels; and compensation for those suffering retaliation for speaking out. 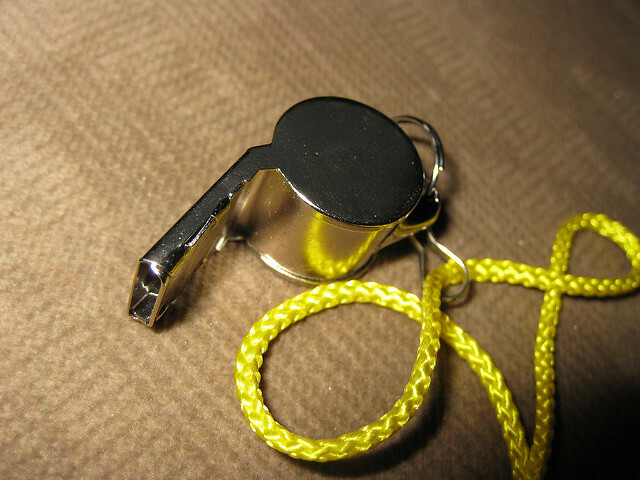 Having a strong whistleblowing regime has many benefits. First, whistleblowing is a common and effective way for corruption to be uncovered. Second, it complements government corruption detection mechanisms at no extra cost. Third, in the public service whistleblowing can help to ensure that tax money isn’t wasted on fraudulent activities . And in the private sector, it increases productivity and growth. However, whistleblowing requires comprehensive protection laws. Australia particularly needs to strengthen whistleblower protection in the private sector which is much weaker than in the public sector . Private sector whistleblowers can be protected under the Corporations Act 2001 only if they meet certain criteria . One is that they must have a current relationship with the company their disclosure is about. So they must be a current officer, employee, contractor or employee of a contractor. Former employees don’t have any legal protection when they come forward. That’s a real limitation, as people with information about wrongdoing may feel safer in reporting it after they have secured a new job. Another criteria is that whistleblowers must give their name to the person or authority they are making the disclosure to. Thus, anonymous disclosures or disclosures to third parties, like an MP or the media don’t receive legal protection. This means some whistleblowers may stay silent. Whistleblowers must also have reasonable grounds to suspect that a law has been breached. This involves a high burden of proof, and likely would involve the whistleblower engaging a lawyer to work that out. Often employees don’t report wrongdoing due to fears of reprisals, like disciplinary action or potential job loss. They may also be worried about acting against organisational culture, harassment, counter-allegations and a concern that the matter won’t be taken seriously. The negative experiences of high-profile whistleblowers in Australia such as Brian Hood  (Securency International and Note Printing Australlia ), Jeff Morris  (Commonwealth Bank financial planning), and Toni Hoffman  (Dr Jayant Patel case ) only add to this perception. These problems need to be addressed. A culture change is required, backed up by law. A change of culture within organisations is necessary, to one where employees feel comfortable raising issues to management. The right ‘tone from the top’ is crucial. A basic starting point is a clear whistleblowing policy on how matters should be treated. The appointment of a whistleblower ombudsman is also needed. Having a third-party to report wrong-doing to would encourage those fearing retaliation from supervisors to still come forward without necessarily passing through the chain of command. Needless to say, anonymity also factors into the effectiveness of whistleblowing protection. It would be helpful to have a crimestoppers-like hotline where anonymous calls can be triaged and investigated. That, of course, would require a cultural change at the individual level too. Australians need to take the ‘if you see something, say something’ approach from the street to the office. Enhancing protection against reprisals is also particularly important. Australia can learn a lot from the US, where criminal penalties against those who retaliate against whistleblowers can be imposed. But punishing retaliators isn’t enough. Australia should again follow the US example, and offer compensation to whistleblowers as well. This proposal already has the support  of Australian Securities and Investments Commission chairman Greg Medcraft. Before the Government commits itself to the creation a new regulatory body or other solutions, any successful anti-corruption strategy should endeavour to overcome the fear of blowing the whistle. Cesar Alvarez is a researcher and Simon Norton is an analyst in ASPI’s Strategic Policing and Law Enforcement program.